Mike Hartner is a father, son, author, patriot, geek (ret), and husband. His love of all things genealogical led him to writing, and writing has now led him to fiction and a large epic saga. He lives in Vancouver, BC with his wife and son. 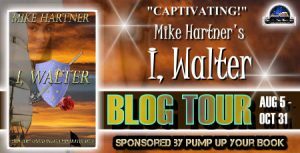 His latest book is the historical romance, I, Walter. Soon afterwards, my father lost enthusiasm for his business and became generally passive. I assumed this was because of Gerald's leaving, and only on occasion would I see flashes of my dad's former self. At the start of my tenth year, our family moved closer to London. We rented the bottom floor of a three-story building in which several families lived in the upper floors. My father said we relocated because he needed to be closer to more business opportunities. But my mom didn't believe he'd made the right decision, since he was now selling food out of a cart and not inside a storefront. One night, she greeted him at the door when he came home. She was wearing a frown and a dress that had seen better days. "Did you bring in any decent money?" she asked him before he had time to take off his coat. "I told you, it will take some time. It's not easy to make good money these days." "Especially when you let the ladies walk all over you." "I know, I know. But what am I to do when they aren't running up to me to buy what I'm selling?" "You at least bring home some food for us?" My father had carried in a bag under his arm. "It's not much, a few carrots and some celery." He handed her the bag. "We're not ready for meat yet." "That’s true enough," my mother said. "But you should at least try to feed your family. Walter's growing, and so are our other children." "Leave me be, woman. I'm doing the best I can for now." He sat in his chair, leaned his head against the wall, and fell asleep.